The 3322 E-Commerce Auto-Mailer creates custom bags that are sealed and trimmed using minimum length. The bag sizes range up to 30 x 19.5 x 8 in. (L x W x H). The units accept random size packages from Texwrap upstream belted conveyor or upstream conveyor. The mailer scans the bar code and the address information is send to ID Technology print ad applied labeler. When the package reaches exit conveyor, the bag is sealed and the address label is automatically printed and applied at the exit conveyor. Texwrap designs give e-commerce distribution centers more effective use of valuable floor space, lower labor and shipping costs, and greater operational flexibility. WASHINGTON, MO. 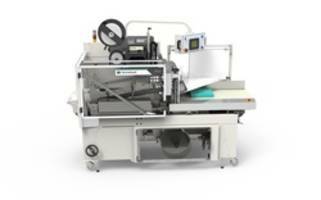 (PRWEB) SEPTEMBER 20, 2018 - Texwrap, a product brand of ProMach, will introduce the 3322 E-commerce Auto-Mailer at Pack Expo at McCormick Place in Chicago October 14-17, 2018. This is an automated wrapper/labeler that not only makes more effective use of valuable floor space because of its 25 percent smaller footprint length, but it also gives distribution centers other key advantages when compared to competitive machines. These advantages include a much lower purchase price as compared to sideseal wrappers, cost savings from lower dimensional weight (DIM) by transitioning from boxes to poly bags and reduced material consumption, reduced labor, and integration of ID Technology’s model 252 label printer applicator to make to make shipping products quick and seamless. The 3322 Auto-Mailer creates ready-to-ship custom-sized mail packages in a unique operation capable of integration with a labeler and multi-carrier shipping software and gathering and reporting data on exceptions to more smoothly run order fulfillment. The 3322 Auto-Mailer accepts random size packages from an optional Texwrap upstream belted conveyor or the customer’s existing upstream conveyor. As the packages transfer on to the 3322 infeed conveyor, the bar code is scanned and the address information is sent to the ID Technology print and apply labeler. The package is paused momentarily on the exit conveyor of the wrapper where the proper bag size is sealed, and the address label is automatically printed and applied. When the sealing cycle is complete, the exit conveyor transfers the finished package out of the wrapper. Distribution centers can use these compact auto mailers to increase the number of lines in their plant. Because the 3322 Auto-Mailer is small, portable, and rolls on casters, it can also be deployed anywhere at any time – useful in changing operating conditions and work environments. Throughput is rated at up to 20 packages per minute. A switch from packaging orders in boxes to utilizing poly bags will not only significantly lower DIM shipping costs but will also reduce labor costs by up to 50 percent. The 3322 E-commerce Auto Mailer differs from other all-in-one poly-bag packaging and labeling systems because it can create custom bags for each product, based on the contents’ unique size and shape. Tailored bags are sealed and trimmed using the minimum length needed to bag each product. Bag sizes range up to 30 inches long x 19.5 inches wide x 8 inches high. This machine is easy to operate and maintain and is built for exceptional durability, providing years of productive service. Texwrap warrants the 3322 E-commerce Auto Mailer for three years. See Texwrap at Pack Expo 2018 – Booth #S-3550. On display and running live will be Texwrap’s ST-1607SS, an affordable shrink wrapper optimized for packaging operations requiring up to 65 packages per minute output. Known as the industry innovator, Texwrap holds patents on some of the most significant breakthrough technologies in the shrink wrapping and bundling business. Texwrap produces automatic shrink wrapping systems, L-bar sealers, side sealers, tunnels, infeed solutions, and conveyor systems for the food, bakery, industrial, mailing, pharmaceutical, nutraceutical, retail, printing, and publishing industries. Texwrap also manufactures the Tekkra line of shrink bundling systems. As part of the ProMach End of Line business line, Texwrap helps our packaging customers protect and grow the reputation and trust of their consumers. ProMach is performance, and the proof is in every package. Learn more about Texwrap at http://www.Texwrap.com.